As the NSA was likely to be unique in this country it clearly had to be as flexible as possible. The whole range of space frequencies would have to be catered for, i.e. 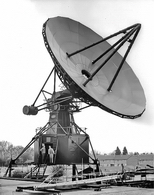 from 100 to 10,000 MHz, The modes of operation were required to cover Radar, Communications, Telemetry and Tracking. To make best use of available expertise, tried and tested circuitry was to be used. This meant, in the main, valve circuits. Tracking accuracy was a first essential. Ideally a 50ft dish at S—band would have given a half degree beam width and a pointing accuracy of 1/10th of a degree was needed to keep the beam on the target. Eventually an aerial mount which had been the servo test bed for the “Blue Anchor” radar tracker was discovered. This had a higher slew rate than was required but could only accommodate a 45ft dish. 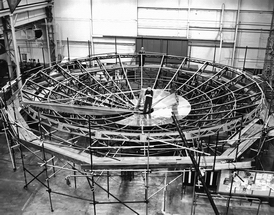 Hence NSA was fitted with a 45ft dish built in North Site workshops. The aerial was erected in 1962. Total weight of the structure was 54tons. The load on the azimuth turntable was 25tons. This was a large cabinet like a four foot wardrobe with two doors covered in banks of switches. 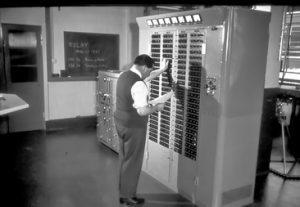 The values to be set on the switches were computed on the Elliot 803 and set in before the satellite pass. This labour together with the half hour warming up time for the valve D.C. amplifiers meant that the operator needed plenty of notice of an impending satellite track. The”Time of Day“ at one end to local oscillator and transmitter frequencies at the other were derived from a single crystal source. As short term stability was important it was decided not to use a crystal oven to avoid oven cycling so a hole was dug in the floor of the control room,. Tom Hawthornthwaite takes up the story… (I asked for 10ft but they could only manage 8ft), and the crystal, in a sealed container, was lowered down the hole. The transmitter was built for the tracker by Nigel Nicholls’s division on the ticket of “An experiment in the art of paralleling output klystrons”. Due to the high powers which were planned the output stages were housed in a screened room known locally as “The death chamber”. The planned power of the transmitter was 10MW peak and 20 KW mean. As the output valve required 200kV, lead shielding was placed around it to absorb the X—rays. The limiting factor turned out to be the waveguide running up the aerial which would arc across if the power exceeded 4.5MW. Improvements were made to the waveguide over the years but we were never able to run a track at 10MW. Signal level calibration was achieved by tracking a small calibration sphere. It was found that a sphere the size of a table tennis ball was resonant at S band so several table tennis balls were copper plated and taken up to 20,000Ft over Wales by a Canberra aircraft. I seem to remember that the pilot pushed them out through the “Very” pistol aperture. We tracked the aircraft and when the pilot called “gone” we stopped the range gate and let the aircraft fly on then lock—followed on the ball recording the signal level. Tracked on July 10th 1962 using the same receiver system as for Ariel. We tracked the first three passes of Telstar visible from the UK including the first, and only partially successful, attempt by the Post Office, (as it then was), to receive television signals at Goonhilly. We were able to tell Goonhilly, by ‘phone, that the satellite was indeed on station and perhaps they were not pointing correctly (cheeky). In fact it later transpired that they had the wrong hand of circular polarization on their aerial. Echo ll was a 135ft diameter balloon launched on January 25th 1964 from Vandenburg AFB California into a 500 mile polar orbit. The balloon material was a laminate of Mylar and aluminium about 1/300 mm thick. lt was put into orbit by an Agena final stage rocket. This balloon provided a lot of work for RRE mathematicians. We were told of its actual lift—off within 30 seconds by telex. After orbit injection and completion of the final stage burning, the canister containing the balloon separated from the final stage container. Two minutes later the canister was blown apart and the balloon inflated. The inflation was monitored by a TV. camera in the nose of the Agena rocket and telemetered down to Johannesburg, so we knew that this phase had gone according to plan. The two halves of the canister were seen to separate across track. The balloon contained 72 bags of pvrazole crystals which vaporised in space and were expected to provide a pressure of 5000 p.s.i. which would take the skin beyond its elastic limit so as to preserve the spherical shape should it be punctured. However during the first orbit a telemetry station reported a catastrophic drop in pressure whereas pressure should have been maintained for about 20 hours. On the next orbit we were able to observe the satellite but the beacon signals were fluctuating so wildly we could not use them to put the radar on to the target. We acquired ECHO 2 on the next pass but it did not look anything like the good reflector expected of a l35ft dia. sphere. After tracking ECHO 2 every evening on its North—bound passes for ten days we received a phone call from NASA asking us to observe the South—bound passes early in the morning of 7th of February. The satellite was due to enter the earth’s shadow for the first time and as ECHO 1 had deteriorated badly as it went from 300 degrees Kelvin to 100 degrees they wanted some observations of the eclipse of ECHO 2. Our radar was the only one in a position to make the observations. On the second pass just before the predicted eclipse, we received a peculiar reflection with a long writhing tail. A more intensive series of trials revealed that this peculiar reflection only occurred when we were looking down South, Eastward in the evening and Westward in the early morning. a) What size is the hole and? Calculations suggested that if the balloon had a 0.8 sq. metre hole the interior of the balloon would act as an echo box and give the effect we were observing. b) What could have made the hole? As the satellite was revolving something must have struck it to cause it to revolve. A meteorite, or other piece of space debris, would have gone straight through making two holes and we were sure that there was only one. Our mathematicians considered the mass of the pieces of hardware associated with the launch and to cut a very long story short came up with the following explanation. When the two halves of the canister separated across track they were then following the satellite around but in slightly different orbits. These orbits would cross over on the other side of the earth and as they did so one of them could have pierced the skin of the balloon. We calculated that the hole was on the spin equator, as you would expect, and that the collision occurred over the Pacific at 15.47 GMT at 148W, 42N in orbit one. All observational data was sent to NASA and later the story of ECHO 2 and the Malvern Effect appeared in the New Scientist of 28th January l965. By now the experimental satellite tracking team was being disbanded, but as a lot of data on Russian space objects was being sent to NORAD on a regular basis Dr Murray managed te persuade MOD to provide an RAF detachment to run the tracker and daily routine tracking was gradually handed over to them. By now, 1974, the RAF were finding it increasingly difficult to justify keeping an outpost in Malvern. They eventually handed the equipment over to GCHQ who had been making use of our facilities, in great secrecy, for some time. The operations organisation of the R.R.E. Satellite tracking station. 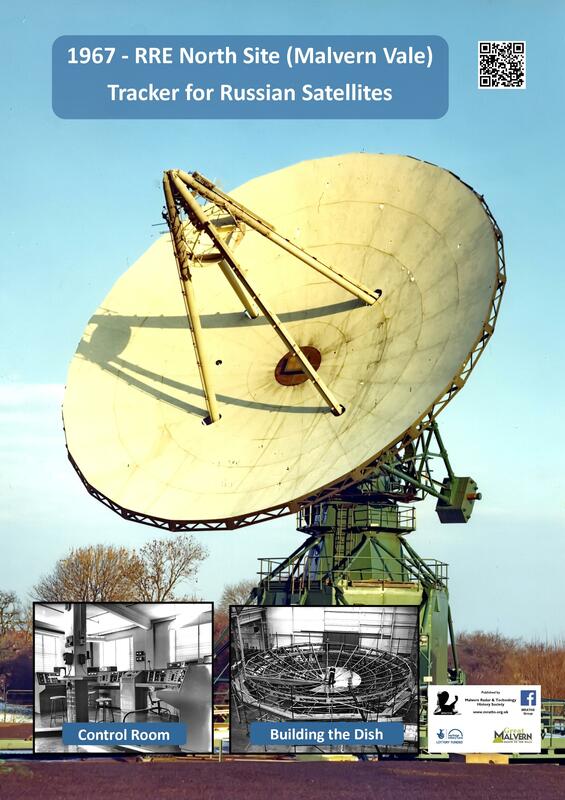 Radar tracking at RRE Malvern, W.A.S. Murray. Philosophical Transactions of the Royal Society of London vol 262 pp41-45 1967. Determination of the spin axis orientation of satellite UK-3 by radar signature analysis.